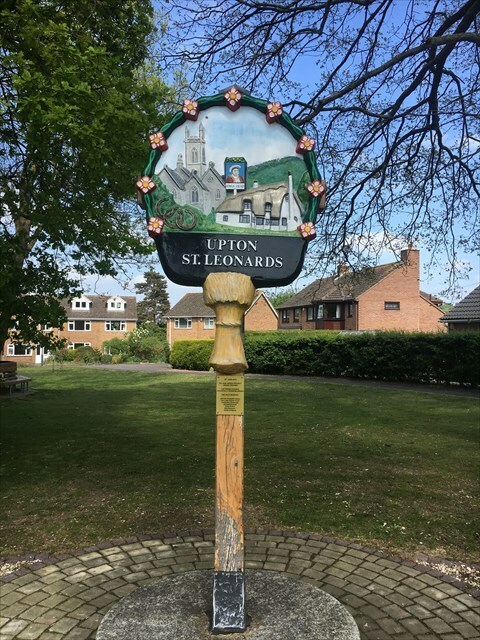 The village of Upton St Leonards became a settlement sometime in the 10th century. There are many Roman remains that lie buried beneath the village. A Roman mill was discovered during the construction of the nearby M5 motorway and numerous other Roman remains were uncovered during the construction of nearby Abbeydale and Abbeymead. During Tudor times Henry VII and Anne Boleyn visited the parish when they stayed at the nearby St Peters Grange in Prinknash and during the Civil War Royalist troops were billeted in Upton during the siege of Gloucester, Charles I stayed at Selwyn House in nearby Matson which at that time was part of Upton. The headline co-ordinates will take you too the village sign. You will find 2 signs on the front and back of the village sign's post one from 1994 and one from 2014. 2) arne sbbgcngu tngr vf n ynetr ebhaqrq srapr cbfg jvgu n abgpu arne gur gbc, pbhag 5 fznyyre ebhaqrq srapr cbfgf nybat gur cngu gur gerr vf bccbfvgr gur 5gu cbfg.